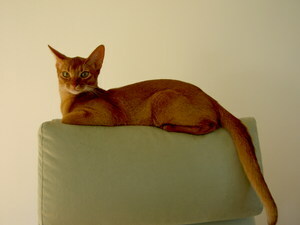 The story of Redcheetah's started in 2004, when my second abyssinian, sorrel Proxima Gepardi (Geri), moved to us. When this beautiful young cat lady grew up, I really realized: what a treasure Anne (FIN*Proxima) had given to me. Thank you! I went to many cat shows with Geri and most of them were successful to us. So the total aby passion took over me. I started to think of breeding. After serious thinking my cattery name FIN*Redcheetah's was accepted in FIFE in summer 2005. I chose my cattery name as a respect to my sorrel Gepardi = Red cheetah. She is my darling source of inspiration for my breeding. My goal is to breed healthy abyssinians according the breed standards, but most of all and beside the external beauty I want/hope Redcheetah's abys to be personal and kind abys, which charm their owners totally. So beside the external beauty I pay attention to cat's character because I think one of the most important task for every cat is to bring joy and happy moments in everyday life. The success in cat shows is of course very nice plus side to each cat owner but only if you are interested in going to cat shows. The good cooperation is very important to me. This applies to the relationships with Redcheetah's cat owners as well as with other breeders. I'm open for discussion and it is always interesting to hear other views of cat things. Above all I'm very thankful for all the help and advices I have received from Anne and other more experienced breeders since the beginning.